I'm often asked if I think about cutting myself anymore. This is usually preceded with, "have you cut yourself", if my doctor or therapist is talking to me and followed by, "how often", by those curious as to how I could possibly want to do that to myself. The best way I have ever been able to explain it, is to compare it to how a recovering alcoholic might feel. One may never drink again because they know it is bad for them, but they do think about it, especially during high stress situations. The solution---replace the negative thoughts with a positive solution. On the worst day, call your sponsor or in my case call a trusted friend/family member or my therapist. I can honestly say that I probably THINK about cutting every day. Most of the time it is a fleeting thought. For example, pulling out a knife to cut a fruit or vegetable, shaving my legs, using scissors to cut coupons, seeing someone on a TV show portraying the act, etc. A memory will flash through my mind or a recognition of how far I have come. Other times, if I have had a very bad day in that something or someone has triggered me, I may think more intensely about it. I know what it feels like, so that desire to replace the emotional pain with the physical pain is automatic, but I have learned how to distract myself. And then sometimes, I just want to do it. I want it like a man who is dying of thirst wants water. A couple of weeks ago, I found a box cutter in my garage and I brought it inside and just sat and stared at it for what seemed like an eternity. I imagined every moment, every slice, the beauty of each pointed contact.... and that was enough. I have the strength to NOT follow through. In my case, for now, the thoughts are enough. However, like any addict, I know I am just one cut away from going down the same path. The affects that my cutting behavior has had over my lifetime have altered my need to cut at this point in my journey. So when asked if I think about cutting myself--the answer is yes. Have I cut myself recently--no. How often do I think about it--every day. Should anyone be concerned about me hurting myself at this juncture--no. If I ever get there again, I know what to do. I now know how to stop it. I'm not saying I won't; the last time I cut was 3 months ago. But, I didn't keep it up. I fell down, I pulled myself back up and I started over. I consider that a success. When I got married, I never thought that I would divorce. Granted, I got married during a time in my life when marriage was probably the last thing in the world I should have been doing. Without dredging up the past too much, I met, fell in love (at least the closest thing to what I thought was love) got married and had a baby all in the middle of a classic nervous breakdown. Needless to say, my husband married someone who he really didn't know. At least he didn't know how troubled I was at the time. With that said, he was then and is now the closest thing I have to a best friend. Our relationship is an anomaly. He loved me wholly and unconditionally and my struggle with depression, BPD and trauma finally drove him away. Don't get me wrong. He is not without fault. Two damaged people will inevitably find each other, but the depths of chaos that I would take both of us was not anything he expected. Our divorce was not your typical divorce... we didn't want to NOT be married. The reality is that staying married would hinder me from getting better. He couldn't help me anymore. I had to learn to help myself and the only way to do that was for him to let me go. 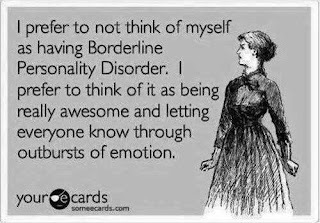 Borderline personality disorder has one defining symptom. There is no grey. Everything is black or white; I either love you or I hate you. For years, he had to deal with me fighting him, cursing him, hating him only to beg him to stay, expressing my undying love and need for him when he finally had enough. Letting me go was the hardest and greatest gift he gave me. 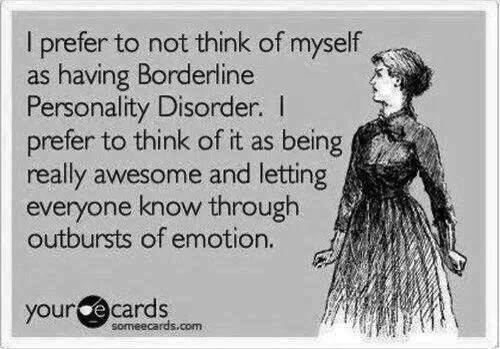 Being in a relationship when you have BPD is nearly impossible until you have your emotions under control. The extreme emotions swirl through your head changing at any given moment. It is a feeling of being completely out of control and having no idea why. By being out of the relationship, I can now focus on my mental health 100 percent, yet I think about what I lost often. I don't know if I will ever be able to "fall in love"again. As emotionally passionate as I am in a relationship, I am quite disconnected outside of one. 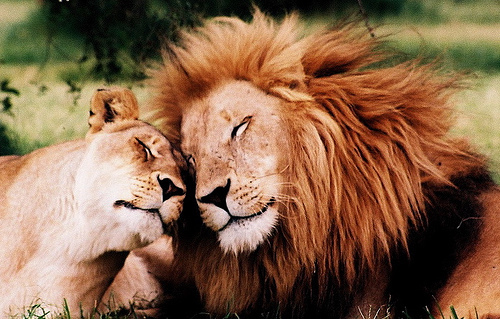 It is hard for me in the present moment to even imagine being with anyone else. My ex and I still spend a lot of time together as friends. We both focus on being good parents and ironically our friendship is stronger now than it ever was. Again, I think that is because I can "turn off" my feelings so easily. His love was so intense, I don't know if anyone else could ever compare. Or maybe the intensity was fueled by my own delusions. Regardless, I am blessed that he is still there to support me on this journey. I want for him only to be happy. It is exactly what I want for myself... yet it remains easier for me to want that for him. It is the first day of September...Summer has passed and we now move into fall which is my favorite time of the year. There is something about the weather changing, the leaves falling, colors turning into gorgeous oranges, yellows and browns. Fall feels like transformation, a pre-dormant season before we hunker down for the winter preparing ourselves to blossom in the Spring. I think about all that has happened since last September and it feels like a lifetime ago. I am not the same person I was then. Or perhaps this is the woman I always was but just didn't know. I have committed myself to write daily for the next year so as to very clearly track this final part of my journey. At some point, I will take my past, my present and my future and compile it into some kind of memoir that I hope will one day help other young men and women who may have similar circumstances. Until then, this final lap is perhaps the most crucial. I have stabilized myself so that I am thinking clearly. I have taken accountability for all of the pain I have caused and I have literally paid the price and suffered the consequences of bad choices and illegal behavior. So here I am. Forty something. Divorced. Medicated. Physically unhealthy. Mentally raw. Yet... finally. Yes, finally liking myself and dare I say it... recognizing that I am beautiful, scars and all. I went back to college this past summer semester. It was brutal. Not only was I reminded by my advisor how badly I screwed up from 1988-1994, but I had to challenge my ability to focus and follow through with a brutal schedule. I happily can say, "I did it". I am now registered for the Fall 2013 semester and attending classes. I feel as if I am thriving back in the classroom. There is this inner desire for learning that I hadn't even realized I possessed. No matter how much I am intimidated by my own insecurities, I literally soak up all of the knowledge that I am being given and covet it. It was hard to get back into the habit of studying over the summer. I still feel challenged by this, but I am finding it easier to follow through and make the time to do what I have to do. Yet another success as far as I am concerned. It is still a daily struggle to stay on top of my depression and not allow the "noise" around me to distract me from my goals. Relationships with my family are still dysfunctional and in some cases non existent. I am working through intensive counseling and fighting memories and feelings that I have long buried with the intention of bringing them to the surface and re-programming them. The goal is to redirect the unhealthy triggers into something less frightening. And I feel very alone. I am not isolating in a self destructive kind of way. Yet, I know I have definitely been isolating myself. The resurgent of this blog is one of the first steps (after going back to school) that I am hoping draws me out of myself more. I realize that my biggest issue right now is that I do not trust anyone. I question all intentions and I purposefully steer away from anything or anyone that might draw out any kind of gullibility. So, yes, I am a work in progress. As we all are. The goal.... one day at a time. No lying. No manipulating. No stealing. No hurting myself. No pretending. Find happiness. Find self love. Learn to trust. Learn to love. Forgive. Have hope, faith and courage. And above all....breathe.